SPOKANE, Wash. – As an intern with the Washington Small Business Development Center, Collin Tracy says his job was to help people’s dreams come true. Owning a small business is often part of the American Dream, Tracy said, and he was one of more than a dozen undergraduate and graduate students (from WSU Pullman, WSU Spokane, Seattle Pacific, Whitworth and Gonzaga universities) who provided critical market research that helped small business owners start or grow their business. In 2017 the Washington SBDC market research intern program completed more than 165 reports, covering 93 different industries, analyzing market conditions throughout the state, across the United States and in 37 different countries. 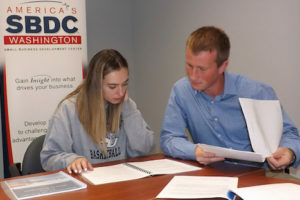 Students from participating universities apply classroom knowledge and skills learned from SBDC mentors to pull relevant data from more than 200 domestic and international government, industry and trade databases to answer specific questions about market conditions. Tim Taylor, supervisor of the SBDC internship program, said the goal is to help students develop professional skills that boost their employment opportunities while providing business owners with solid data on which to make business decisions. Students are paid for their work and typically work about 10 hours per week during the school year, a little more during the summer. “Clients are very appreciative of the work they do, but the biggest thing is the value to the young person to grow professionally in a supportive environment,” Taylor said. The program is “intern-owned,” Taylor said, in that students help with training and make suggestions to improve work quality or work flow. When the program started seven years ago, reports regularly took six to eight weeks to complete, but now they typically take three and a half to four and a half weeks to complete, depending on the scope and complexity of the research. Now is the time, Taylor said, when SBDC offices are recruiting new interns. Interested students can contact him at tim.taylor@wsbdc.org. The research can be tedious and frustrating at times, Taylor said, but the feedback he gets is that students enjoy it, too, because they can see the positive impact it has on SBDC clients. Helping business owners make data-driven decisions is a central mission of the Washington SBDC. The Washington SBDC network includes more than two dozen expert business advisors who work in communities across the state to provide no-cost, confidential, one-on-one advising to small business owners and entrepreneurs who want to start, grow or transition a business. The Washington SBDC is hosted by Washington State University and is supported by federal funding from the SBA and one-to-one cash match from state and local institutions of higher education and economic development. Kneeland-Salem, who said she hopes to do business consulting one day, said she loved the variety of businesses she researched. “One day it was an oat farmer and the next day it was a brewery or a preschool,” she said. “We are always talking to each other,” Kneeland-Salem said. Teams have to work out who will be researching which questions, but they also discuss which databases to consult and then debate the quality of the data they find. “We use primary sources material whenever possible,” she said, which means databases that have information culled from various sources, such as expert statistics, company SEC filings, federal and state data and industry reports. Allan Peterson, the SBDC business advisor in Moses Lake, has requested more than 20 reports on behalf of his clients in 2017. Peterson, with help from SBDC export specialist Vern Jenkins, has been working for five or six years to help business owners in Grant and Adams counties explore and capitalize on export opportunities. This year Peterson is working with more than two dozen clients who are starting or expanding export trade to Japan and Korea, and international market research has been critical to those efforts. “The reports are well written,” Peterson said. They start with an overview and then get more detailed and the source for the information is always included. Haan, who graduated from WSU in May 2017 with an accounting degree, said the internship helped her develop her analytical and professional writing skills. Clients don’t have time to wade through an information dump, so she and her teammates worked hard to present the most relevant information as concisely as possible, while still giving clients a detailed report. Isaac Griepp, a senior at Washington State University, applied for the internship last spring after hearing Taylor give a presentation at the Delta Sigma Pi business fraternity at WSU. Over the summer Griepp, worked out of the SBDC office in Vancouver where Buck Heidrick, an SBDC business advisor, provides one-on-one advising to a variety of small business clients. “That was my favorite part,” Griepp said. It was an incredible opportunity to hear first-hand accounts of challenges that small business owners face, and then to hear how Heidrick would work with the client to find solutions or resources to address those challenges. 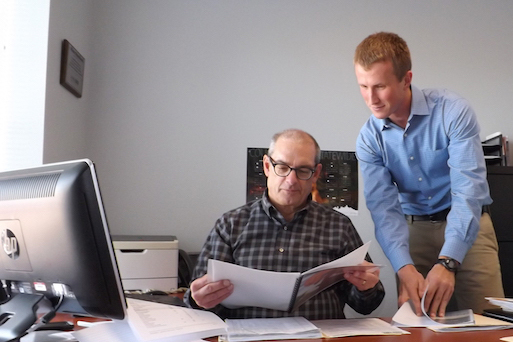 Grippe said he’d like to own a small business one day, and the SBDC internship has already given him a valuable insights and perspective that he couldn’t have gotten any other way. Tracy, the Whitworth graduate who now works for Rep. McMorris Rodgers, said he, too, appreciated the perspective he gained by working with the Washington SBDC.